“An ounce of prevention is worth a pound of cure.” Yes, yes, though sometimes the cure is not so onerous. When knitting a lace shawl this winter, I thought I had prevented the risk of running out of scarce yarn before finishing the pattern. Not enough prevention, however. I ran out of yarn with an incomplete, unusable shawl. So much for prevention this time. Great drape, long length to this shawl. My cure, detailed previously, involved ripping out more than half the shawl and knitting on from a new midpoint. The cure worked, leaving only 10 yards to spare. It was not painful; no feeling of a pound of cure, far more like an ounce of cure. And I like the result a lot. 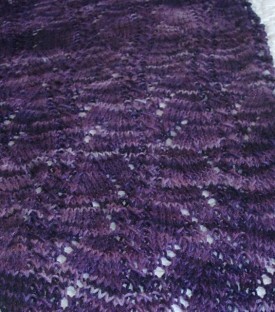 The Mallory Hills Shawlette blocked out to a generous wingspan of 66″/168 cm with depth of 22″/56 cm at the central point. More like a scarf than a shawlette in proportions, perhaps. Knit in Miss Babs Tarte and blocked, the fabric has a lot of soft drape and a soft hand, making it easy to wear. The addition of 10% Tencel to 75% Merino may be the reason. The remaining 15% is nylon, making the yarn good for socks also. The very dark purples in Bubble Bath and its hand-painted nature obscure some of the lace pattern; if I really wanted the lace pattern to show another time, I would choose a lighter and more solid color. I would like to keep the drape at all costs. When looking along the scarf from point to point, I can see the sinewy lines that this lace produces. This kind of magic is part of what lace knitters enjoy. Sinewy lines along wingspan length of the shawl. Nice! 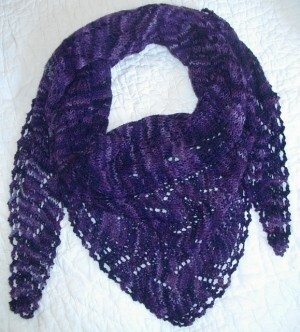 This entry was posted in knitting and tagged fixes, lace, shawl. Bookmark the permalink.